Originally Florence was a fortified area, which was located at the crossroads of the roads leading to the Tyrrhenian coast and those that led to the Apennines, united to travel the high valley of the Arno, towards Rome. Formerly it was an Etruscan locality, which depended on Fiesole. The Etruscans, coming from Asia Minor, settled in the area in the ninth century BC, date of appropriation confirmed by the extraordinary collections of Etruscan art found, currently preserved in the Archaeological Museum of Florence. Only in 395 B.C. Etruscan civilization was subjugated by the Roman Empire. 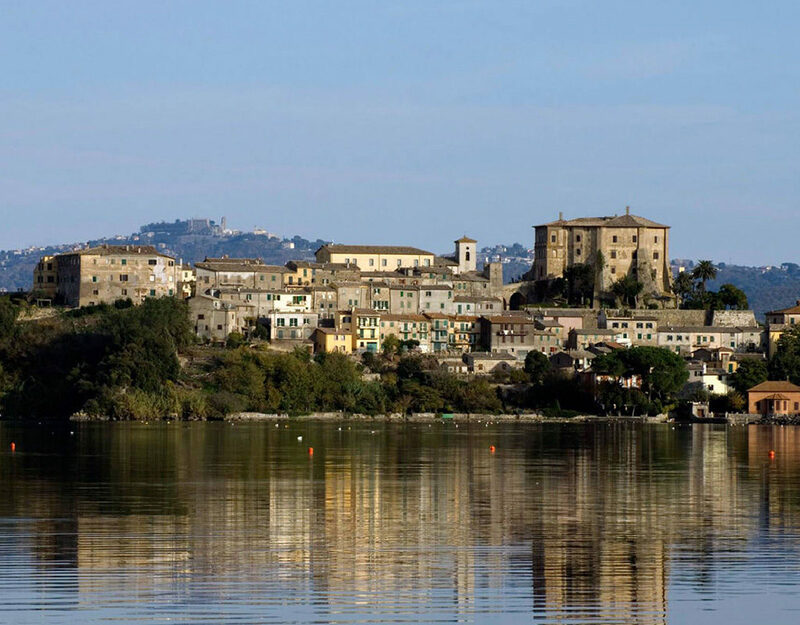 During the colonization campaigns of Silla, the Romans founded Florentia, on the ashes of the ancient Etruscan settlement. In 774, Florence was conquered by Charlemagne, becoming part of the Carolingian Empire. In 1115, the city was liberated, taking advantage of the investiture struggles, headed by Countess Matilde. The Florentines defeated the imperial vicar and conquered the nearby castles and municipalities, to ensure the safety of their commercial activities. In 1218 he entered the war against Pisa, for the hegemony of Tuscany. Between the twelfth and thirteenth centuries, the Florentines participated actively in the wars between Guelphs and Ghibellines, factions that disputed the succession to the crown. 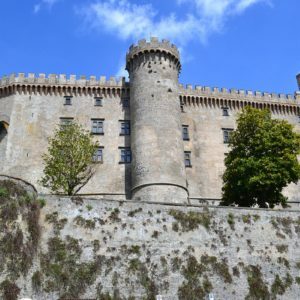 The Guelphs defended the papal power and were opposed to noble privileges, while the Ghibellines, aided by the German emperor, opposed the power of the Pope. Florence was mostly Guelph. The nobility was weakened by these struggles and, in 1293, was expelled from the organs of power, starting the period of the Second People. In this period Florence was the most important city in Tuscany, given that Pisa had been defeated by Genoa in 1284 and Siena began its slow decline. Florentine art was opened to the Renaissance at the beginning of the fifteenth century, coinciding with the state of social and political instability prior to the appropriation of the Medici. The Medici, or rather the richest family in Florence, already showed their political ambitions and intentions since the early fifteenth century, which were able to materialize only with Cosimo the Elder. The latter, without any noble title, managed to take possession of Florence in 1434, completely breaking down his opponents. The Medici family, intimately linked to the history of Florence, ruled in the city, even if with some interruptions, for 350 years! In this period Florence saw both its economic power grow, being the bankers of the Pope, and to be the epicenter of world culture and art. The patronage of Lorenzo the Magnificent marked the course of the history of art forever. Florence is a unique city in the world, in every corner you can see inimitable views almost impossible to find in other cities. 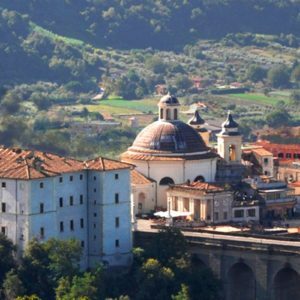 Our tour can start from the port of Livorno as well as from Rome in both situations the view of the Tuscan countryside will be a memory that will accompany you forever. Our professional drivers driving comfortable and recent minivans will give you all the comfort you can for a special day. 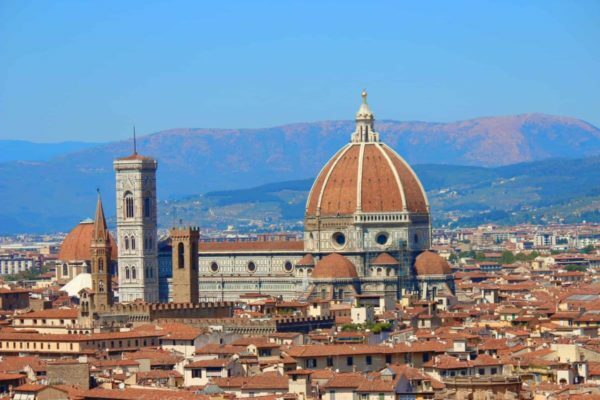 The visit of the city can only start from Santa Maria del Fiore, the Duomo of Florence, the heart and symbol of the city. Every day, thousands of tourists and passers-by flock to this small area between the majestic Cathedral of Brunelleschi, Giotto’s Bell Tower that stands out on the side, and the Baptistery. The façade of the Duomo illuminates the square with the white marble of Carrara in contrast with Brunelleschi’s Dome, which shows the red access of the tiles, the same color that can be admired as far as the eye can see, observing the panorama of the city and its roofs from the heights of the dome. Santa Maria del Fiore is the third largest basilica in the world, preceded by that of St. Peter’s in Rome and St. Paul’s in London. The Dome was built on the model of the Pantheon and built without classical scaffolding (but with a subfloor) because at the time, it was impossible to build such large scaffolding! Designed in the mid-1300s, the Duomo stands 15 meters above Giotto’s bell tower, built in 1334, and 85 meters high. 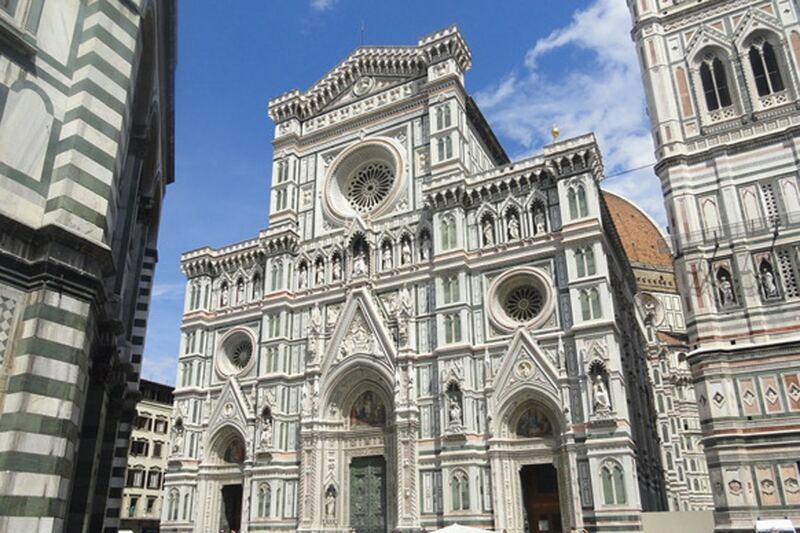 Built in honor of San Giovanni, patron saint of the city, the Florentine Baptistery stands in front of the large façade of the Cathedral of Florence, in the homonymous square, and represents part of the original religious nucleus of Florence. Built on an octagonal plan, the baptistery presents the classic “Romantic Florentine” coating in white Carrara marble and green of Prato, an example of a classic taste that also distinguishes other structures of the city, including the facade of San Miniato al Monte. To break the marble geometries we think the three bronze doors including the famous Gate of Paradise, depicting various scenes of the Old Testament. Santa Croce: This long rectangular square, bordered by wide stone benches, is one of the most loved and frequented meeting points for Florentines: both for the numerous bars and restaurants that crowd the surrounding streets, and for its proximity to the national library. or for the frequent events – among the most famous football in costume – which are held annually. The marble statue of the Great Poet, Dante Alighieri, built in 1865, stands in front of the façade of the Basilica of Santa Croce, also known as Tempio dell’Itale Glorie, to preserve inside it the remains of great artists, scholars and scientists: Foscolo, Rossini, Machiavelli, Galileo, Michelangelo, to name a few. You will be delighted by the chapels decorated by Giotto, as well as rediscovering the works by Cimabue, Canova and dei della Robbia. The central element of Florence’s most famous square, Piazza della Signoria, is the fourteenth-century Palazzo Vecchio, home to the city’s civil and administrative power. Dominate the view the ancient sculptures in marble or pietra serena, like that of the Marzocco di Donatello, the mighty lion resting on the emblem with the Florentine lily; or the Fountain of Neptune, called “Biancone” by the Florentines, the first public fountain in the city. Moving towards the Uffizi Gallery, there is shelter under the Loggia dei Lanzi. Built at the end of the fourteenth century, the lodge housed the ancient public assemblies. Today it contains numerous marble sculptures, with the exception of Benvenuto Cellini’s bronze masterpiece: the Perseus, dating back to 1554, which, with an athletic gesture, exposes the decapitated head of Medusa triumphantly. With its international reputation, Ponte Vecchio is one of the symbols of historic Florence. Allowing the passage over the waters of the Arno, where the river narrows, the bridge joins the historical center of the city with the east area that the Florentines commonly call “Diladdarno”: leaving Piazza delle Signoria and the Uffizi Gallery behind you quickly to Palazzo Pitti and the Boboli Gardens. A peculiarity of the bridge are the artisan shops – once butchers, today refined goldsmith shops – that flank the road but stop at the center of the bridge to make room for two large panoramic terraces. 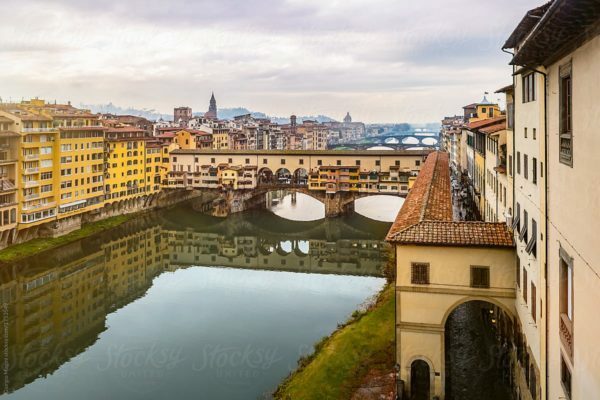 The eastern part of the bridge is surmounted by the Vasari Corridor, built in 1565 to allow the Medici family to get back from the administrative offices of Piazza della Signoria in the residential building at Palazzo Pitti, without ever setting foot on the ground. Private park of the residential building of Palazzo Pitti, the Boboli Gardens connects the famous palace of Florence with the Forte Belvedere. 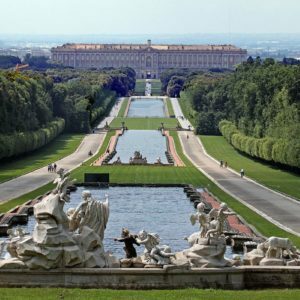 A fine example of an Italian garden, covering 45,000 square meters, the park houses statues, various residences and museums, and presents an architectural-landscape structure that makes it unique in the world. The garden develops in fact on two main axes, cut by transversal avenues: the first axis, starting from Palazzo Pitti, rises rapidly on the hill through a deep horseshoe-shaped amphitheater; the second axis is the well-known Viottolone flanked by two long rows of cypresses interspersed with statues. 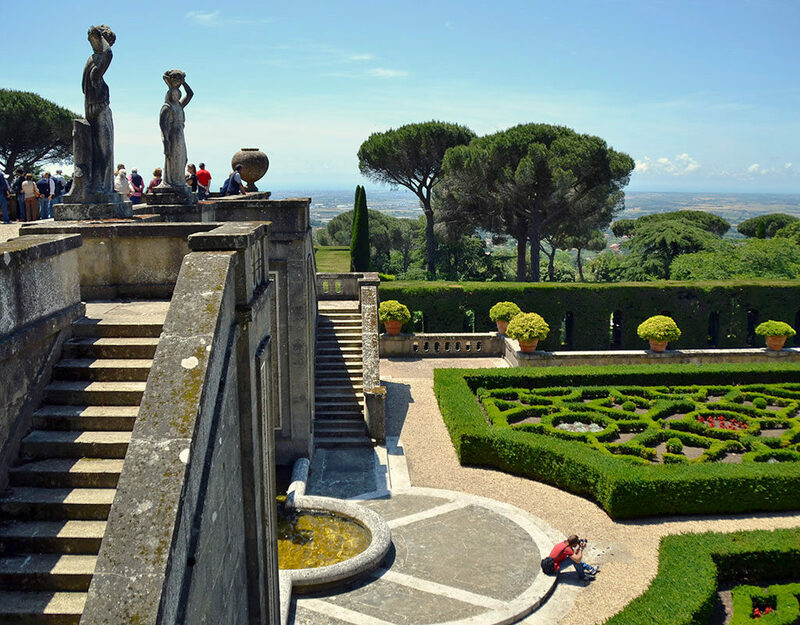 The garden also includes the Museo degli Argenti, the Galleria del Costumee and the Porcelain Museum. The Uffizi Gallery in Florence – whose name derives from the ancient “offices” of the city’s administrative system – collects works from the private collection of the Medici family. It is one of the most famous and visited museums in the world, open to the public since 1591! 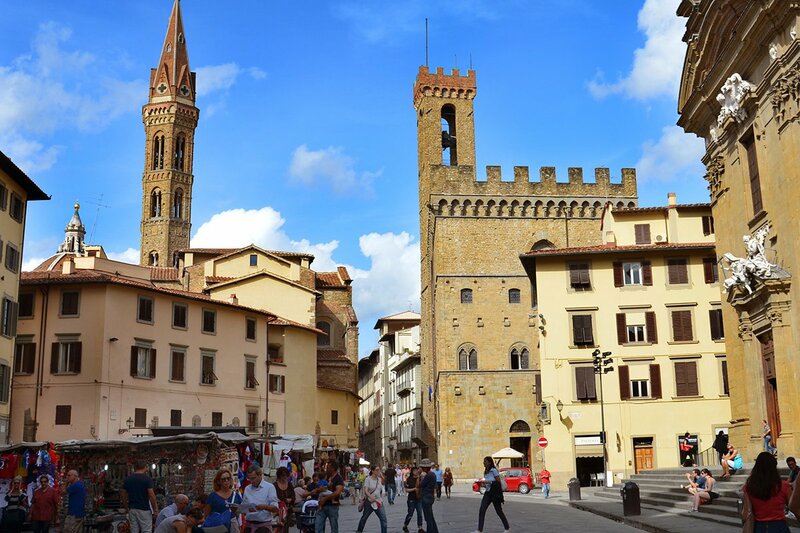 The external structure shows a spectacular portico that joins Piazza della Signoria with the lungarni, and offers a spectacular shot of the Palazzo Vecchio tower. The Doric columns alternate niches with statues of artists and patrons of the time, including Giotto and Cosimo de ‘Medici. Inside there are works of inestimable value, such as the fifteenth-century paintings by Botticelli such as the Primavera and the Birth of Venus. There are also the masterpieces of Cimabue, Giotto, Leonardo, Michelangelo, Caravaggio, Titian, Goya … in an endless list that traces Italian art and not only from the early Middle Ages until the eighteenth century! The line is long, it is better to buy the ticket online in advance! 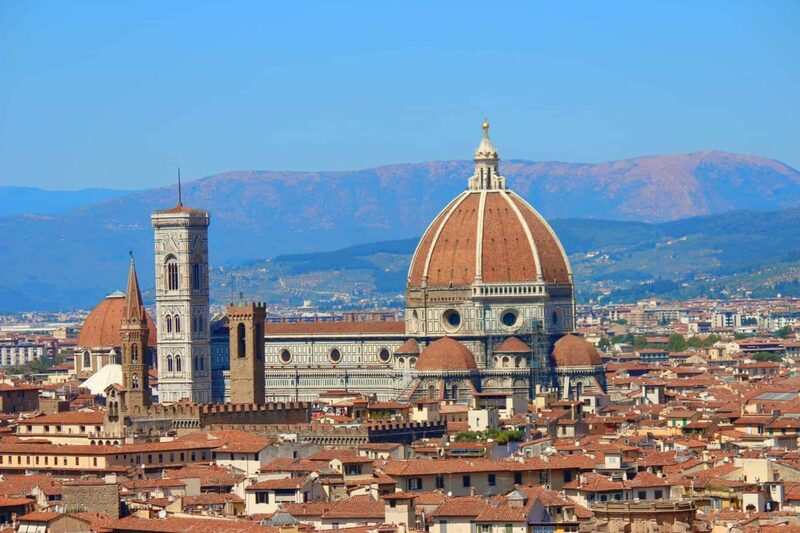 Huge panoramic terrace from which to enjoy a spectacular view of the city, Piazzale Michelangelo – dedicated to the Renaissance sculptor celebrated with a copy of one of his works, the David, placed at the center of the square – was built when Florence became the capital of Italy. Overlooking the stone railing that surrounds it, the panorama of the square offers a suggestive view. The bridges follow each other elegant, illuminated by the colors of the city that are reflected on the water of the Arno. The Duomo, Santa Croce, Palazzo Vecchio, are within sight, as are the hills that embrace the city. To reach the square an evocative walk follows the monumental stairways called Rampe del Poggi from the San Niccolò district, as an alternative to a car trip along Viale dei Colli. Unmissable for every tourist who passes by the Tuscan capital, the Piazzale Michelangelo is also much loved by the Florentines who never tire of admiring their beloved city.